Shore™ Raw Organic Coconut Oil is a truly amazing moisturiser; pure and rich, it will restore natural oils and leave your skin with a subtle dewy glow. It has anti-ageing qualities, helping to minimise brown age spots and hydrating parched, dry skin to keep it youthful and fresh. Coconut oil has anti-bacterial qualities, making it an excellent balm to soothe skin irritation and sunburn. 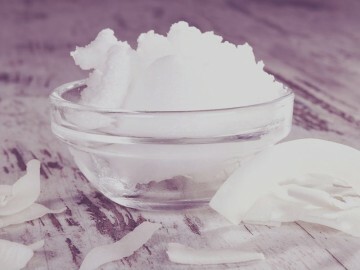 Look after the body beautifully with a scrub made from coconut oil and either sugar or crystal salt. Both exfoliating and moisturising, this is a great time-saving hack for the busy beauty! Use coconut oil as a shaving balm, too. Once again, those moisturising properties are so beneficial when you are using a razor on your delicate skin. Hot cloth cleansing is the top tip from just about every beauty editor; try massaging coconut oil into your skin and remove with a warm, damp flannel or muslin for a deep cleansing treatment that is totally natural (and smells fantastic). Rich in vitamin E, vitamin K and iron, Shore™ Raw Organic Coconut Oil is a fantastic hair conditioning treatment. Apply it to damp hair, wrap in a warm towel and leave it for an hour or two (or overnight) as a pre-wash treatment. Use it to relax frizz in very curly hair and replace your silicone/chemical-based hair serum with a little coconut oil for a natural smoothing, gloss treatment. Gently massaging your scalp with warmed coconut oil will promote hair growth and will treat dandruff and flaky scalp conditions. Smoothed through the lengths of your hair, it will also provide protection from chlorine and sun damage. Have you heard of oil pulling? You will soon. It’s a simple trick where a small amount of coconut oil is swished around your mouth to help whiten teeth. The anti-bacterial qualities are also great at fighting tooth decay, too. Dispense with the makeup bag packed with pots and tubes. Buy a tiny travel pot from the chemist and decant a small amount of coconut oil into it and away you go. Swish a little coconut oil over your cheek bones and eyelids for a great natural highlighter. Use a tiny amount of coconut oil on a clean mascara wand to slick eyebrows into place. Apply liberally to lips to keep them smooth, glossy and totally kissable (and sweet and tasty, too). There’s no need for any other products! Coconut oil is high in a saturated fat called triglycerides; initial research indicates that this particular type of fat has beneficial properties that can have a positive effect on a range of conditions, including diabetes, heart disease, IBS and Crohn’s disease. Including the oil in your diet is also said to help lower cholesterol and aid weight loss. Understanding the full range of benefits to be found in coconut oil is still in its early stages, but the evidence so far suggests that this is one product that you will find incredibly useful and beneficial. All the benefits of coconut oil in humans are mirrored in our dogs and cats. Adding coconut oil to their food can aid digestion, cardiovascular health, diabetes and bone health. Smoothing a little coconut oil through their coats can help protect against fleas and ticks, and condition skin areas that are prone to dryness and flakiness (pads of the paws and underarms). We’ve got the buzz on ‘bulletproof’ coffee – the hipper than hip blend of filter coffee, coconut oil and grass-fed, unsalted butter. This wonder brew will energise you and enhance cognitive performance in a way you couldn’t possibly imagine. You can use this fantastic product to replace traditional fats in your healthy diet, helping you look and feel better from head to toe. Shore™ Raw Organic Coconut Oil is a cold-pressed, extra virgin organic product, made from cold pressings of matured, hand-picked coconuts. Vegan, and suitable for dairy-free and gluten-free diets, you can rest assured that you are buying a quality product, free from additives and completely pure – a product that you can use for beauty, well-being and nutrition. Pre-order yours now and discover for yourself how fantastic and versatile Shore™ Raw Organic Coconut Oil can be. This item will be released on 31st July 2015.